A few months ago, I made a post about the fabrication of the diamond industry, which was inspired by an article in The Atlantic. Just recently, I was exposed to yet another astronomical flaw in the North American consumer market: bottled water. Now, I know there is still a convenience-factor to bottled water that makes drinking it a lot more justifiable. I took this into account when deciding how I would act on this newfound knowledge. Going forward, I have decided that I will never drink bottled water when clean glasses and tap/filtered water are available for free. I suggest you read the article and decide on your own actions. I got pretty worked up when I read this article... and here's why: Aside from the great facts and research, this is such a simple -in relative terms- problem to solve. Society spends so much time on innovation to make things "greener". But think about how tangible the solution to this problem is. It just requires educating the public that tap water is okay to drink. The problem is that nobody with great economic power will likely take part in this, because he'd in turn be taking down an industry that feeds the economy. Regardless, that's the point of this post: To spread the word, one reader at a time. Posted by Zakir Hemraj at 9:05 p.m.
Great post. I really think there should be a ban on bottled water by governments. If they really want to hit their environmental quotas then that's such an easy fix. I think it's difficult to make the change on the consumer level but with more education I think we can get there. Unfortunately it's such a waste. If people are really drinking bottled water for the "convenience factor" then they should just buy a Nalgene bottle. Bisphenol-a aside, they are virtually indestructible (I've tried) and easier to refill than water bottles. 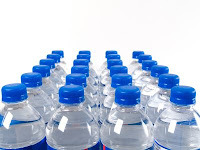 Just recently a Liberal MP proposed a ban on bottled water. It was very quickly and easily turned down by everyone else. Why? Education Minister: There are still many schools completely reliant on bottled water. Tap water in these areas are unsafe to drink. So as soon as tap water IS ok to drink everywhere in this nation, bottled water isn't going anywhere. It is very sad, however, that people fortunate enough to have free drinking water still put forth money to drive this industry based completely upon image.